From then on go to the website of HBO GO or use their app if supported. Please see supported devices between HBO GO and Unlocator at the bottom of this page. HBO is the second largest premium cable channel in the US. HBO is well known for their original TV series and movies. Hit shows like Games of Thrones, Boardwalk Empire, Curb Your Enthusiasm, The News Room and Girls are known world wide and has gained huge popularity. Unfortunately HBO GO is not available Outside the US. However using Unlocator can change all that. 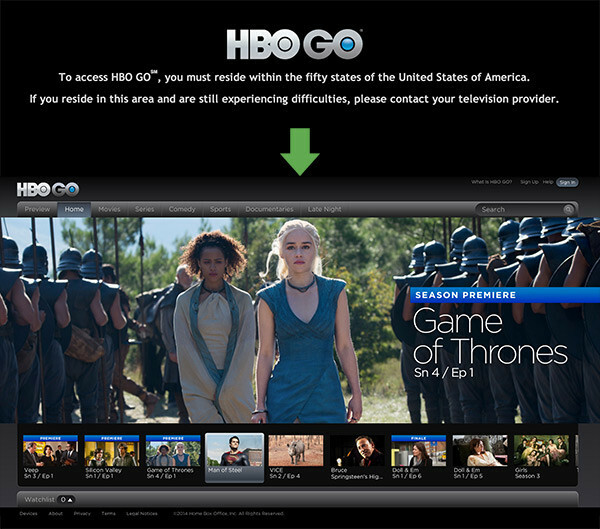 Like most other sites with geographical restrictions HBO Go will detect your location via our IP. The Unlocator DNS service will fool the location detection of HBO Go into thinking you are located in the US regardless of your actual location. All that you need to do is create a free trial for Unlocator and then follow the simple setup guides. You can see a list of the devices we unblock with HBO GO at the bottom of this page.